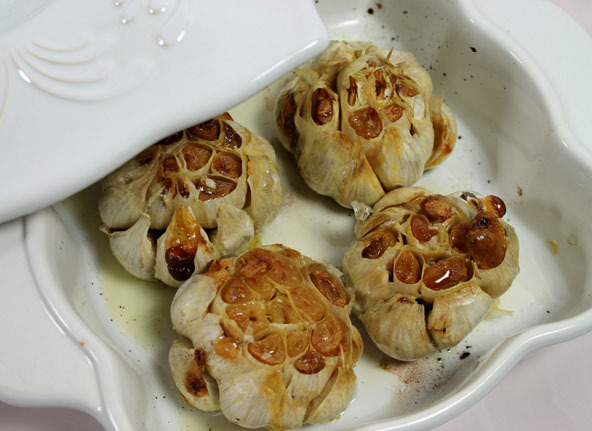 Wow, Did you know roasted garlic is delicious to eat, right from the oven and squeezed out of the cloves? Well, after it has cooled off a bit anyway. Roasting the garlic makes it mild, sweet, and flavorful. It is absolutely wonderful to add into many recipes. See Dairy-Free Roasted Garlic Mashed Potatoes recipe. It can be used as a spread on bread or crackers, mixed with butter or sour cream to top on to baked potatoes and other veggies as well as pasta. Peel the outer layers of skins off of the garlic bulb leaving the individual garlic cloves in within the bulb. Cut the top off of the bulb just enough to expose the tops of the garlic cloves. Place bulb(s) in a small baking dish with a lid or a special garlic baking dish. Drizzle olive oil over the garlic cloves. Bake at 400 degrees in the oven for about 30-35 minutes or until soft and golden brown. Roasted Garlic enhances so many savory recipes. Who knew it was so delicious and versatile? Try it in my Dairy-Free Roasted Garlic Mashed Potatoes recipe. If you haven’t been roasting your garlic, I suggest you get started.